As an evolving industry, changes in the web design field are almost inevitable. As we approach the beginning of 2018, everyone is once again looking forward to emerging technologies, design ideas, and platforms to use. There has never been a more exciting time for brands with the number of opportunities to connect with existing and future customers. However, in digital, the key to success is knowing which opportunities best present themselves for your specific business and audience. In 2018, there are a number of web design trends we see coming down the line that could prove successful if done in the right way. Expect that these trends will influence both the performance of websites and ultimately, the experience of users in the years to come. 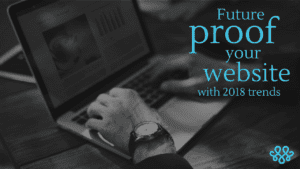 Incorporate videos into your web design. Why? People are reading less and watching more. Using a video on your homepage hero may better portray your company’s mission than graphics with descriptions. With quality and worthwhile videos, you could really capture the attention of the people you want the most. Not only should the videos be eye-catching, they should make it easy for users to get a quick overview of the product or service you are offering. The use of videos to communicate brand messages to users has been more abundant in 2017. There is only more to come in 2018 with a projected 79% of all consumer Internet traffic being video. Need another reason? Google loves video – according to Video Explainers, a business is 53 times more likely to appear on the first page of Google results if it utilizes it on their webpage. The reason? The inclusion of video improves SEO, consequently boosting a business’ place in the rankings. Are you an e-commerce site? Video also boosts sales, as well as recognition of a brand. A study done by Unruly determined the impact of video on brand metrics among 18-34-year-olds. It was discovered video enjoyment increased purchase intent by 97% and brand association by a whopping 139%. Needless to say, video on the web is key in 2018. Recently, we’re seeing subtle animation integrated into pages as a design element, used to draw the viewer’s attention. We’re also seeing more and more of scroll-triggered animation, meaning we can get people to look exactly where we want them to. Scroll-triggered animation encourages users to keep scrolling down your website pages with specifically triggered interactive elements that increase engagement. Here’s one great example of scroll-triggered animation from Apple. These animation triggers are nothing new, but they have begun to be used in a new way. The best scroll-triggered animations are minimalist, educational, and strategic, designed to increase conversions. Scroll-triggered animations can also clean up the look and feel of your website. Instead of having a collection of buttons and menus, your site will convey a true, interactive experience for your users. Implementing micro-interactions allows customers to interact with your website without having to click or wait for a page to reload. An example of this would be allowing a user to leave a simple review by scrolling over a number of stars instead of submitting a form. One of the prime aims of micro-interactions is to eliminate these speed discrepancies and facilitate more productive interactions with your web design. Consequently, this will tempt more and more users to interact with your website. The design features in micro-interactions tend to express attention and communication in real-time. This reduces the presence of miscommunication and enhances the connectivity speed the customers so direly demand in today’s digital world. A trend not likely to slow down anytime soon! In 2017, designers and developers began creating clean and simple websites for better mobile performance. Image-heavy web designs are slow to load and frustrate mobile users. The number of mobile searches is going ever-upward, and mobile-first design for websites is considered a necessity, not just an option. Clean, minimalist designs that load quickly are trendy and desirable for several reasons: both for mobile users and desktop browsers who want quick-loading but engaging websites, and for their SEO value. This is why flat design has started to become popular and will continue to be trending into 2018. Flat design doesn’t mean that everything is reduced down to two dimensions – it’s all about minimalism and usability. It’s about getting rid of clutter and focusing on the important parts of your website. Utilizing bright colors, clean and crisp edges, and lots of open space. Flat design is a refreshing change from distracting and slow-loading hi-res image-based designs. This means two really great things for your website: the first, customers and clients, no matter where they are browsing, will have an enjoyable, quick-loading experience on the website. Secondly, these data-light, fast-loading designs make page speed and optimization much, much faster – which looks really desirable to Google, Bing, and every other search engine. Faster load times mean that your site is more likely to rank well. A voice user interface is sometimes referred to as natural language processing. Simply put, it refers to human interaction with a computer in the form of speech. Examples of voice user interfaces include Alexa, Siri, and Cortana. Voice user interfaces can now understand and act on complex voice commands. When combined with machine learning, these interfaces can predict your needs before you even complete the command. Expect to see websites with their own voice user interfaces or integrating with existing ones like chatbots. Chatbots and voice user interfaces are an effort to achieve a more natural and interactional interface of the website. Natural language processing runs together with the voice search feature. They no longer rely on the standard keywords and phrases such as existing search engines. The bots instilled with natural language processing will converse in a way that is more natural for the user and acknowledge what is being asked. As these web design trends are continuing, you’ll want to be sure to keep up in the digital space for 2018.